I think people are getting upset because this guy just popped up out of the blue with posts entitled "Healthcare is Not a Right" and now this one. He's clearly picking inflammatory topics. I've seen progress notes in actual patients' charts with ridiculous spelling errors that are an embarrassment to be honest. Now, I do make grammatical errors, but not in actual charts. Proof read that stuff! But if he becomes a Lab tech, he's bound to eventually have to report a critical lab value to a leftist nurse! Who will inevitably try to corrupt him with nonsense! As a leftist myself, I have tried my very best to vote for people who will incorporate the most nonsense into ALL courses of study, not just nursing. 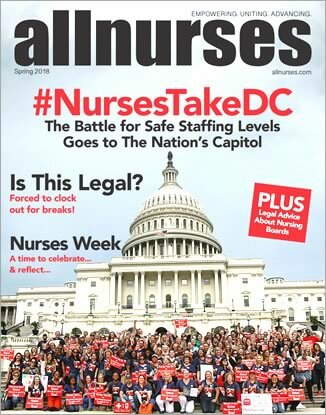 I was so disappointed when I, as a nursing student, saw that all of my instructors kept politics out of classroom discussions. They focused their ENTIRE lectures on health. It was utterly ridiculous. One of my instructors did try to incorporate a bit of nonsense when she showed sympathy for a patient who couldn't afford his anticoagulants and had thus suffered a PE and several DVTs. Hopefully you won't have to endure such horrors. I had time to date--no problem. I dated (and still am dating) someone who was just as busy as I am. Nursing school is busy, but other people can easily be just as busy. Just remember: school comes first. School is a time to be selfish because it's shaping your future. I told my guy that school comes first, no matter what. And he never pressured me to go out on study nights or to stay up late on school nights. Why did this get moved to Blue? Well I hope the charges are upgraded! "Child abandonment and endangerment" is a ridiculous understatement. I'm stuck in a small town for a few more months, and there are no pet stores in sight! The best I have to work with is a Walmart. The healthiest food I've been able to find at Walmart is the Pure Balance brand (both wet and dry). I visited friends and went to a Target near them (it wasn't a Super Target) and found even fewer selections! It's a struggle to find foods that don't have meat byproducts and grains. To be honest, I'm not even really sure if Pure Balance is *that* healthy, but it seems to be the healthiest out of all of the options I have here. I need to ask the vet about all of this for kitty's next appointment, but that won't be for a few more months. So my question to you is: -What brand of cat food do you trust? -What ingredients do you watch out for? -Where do you buy your cat food at? I'm thinking I may need to simply order online. On a side note, do you notice your cat becoming a food snob? :cat: My girl certainly has become one! She'll wake me up at 0500 some mornings! And if I put down TURKEY instead of her favorite (which is turkey MIXED with chicken), she'll literally turn her nose up and run out the door. What a snob! Have you thought about not having a diamond? Diamonds are so common and there's a surplus of them. They're priced far above what they're actually worth. However, if you get a different stone (I love morganites; they're anywhere from light pink to peach usually), it will cost less, the stone will be larger, and the amount you pay for it will actually be fairer for what the stone is actually worth. You are going to nursing school and you are going to be a nurse. And do you know what all of this effort will buy you? Financial independence. Once you become a nurse, you won't be struggling like you are now. Once you become a nurse, you won't need to rely on boyfriends or girlfriends to help you survive. You'll be able to do that all on your own. So if there is ever anybody that attempts to thwart your scholastic success, my advice is to kick that person to the curb. You're going to struggle right now, but it won't be forever. You're 8 months away--you can do it! Take your friends up on the offer. Do what you have to do. Just keep that guy out of the picture and keep working on school. I've heard people talk about drugs more casually than your "dealer" is :roflmao: I was 100% unaware of the underground milk industry, or the fact that it was an underground operation to begin with. But here, have a cigarette.